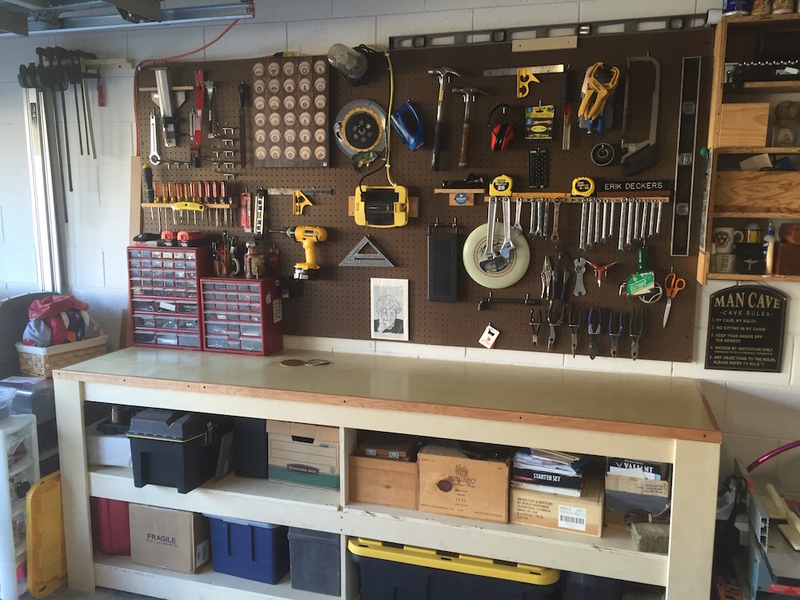 When we moved into our new house in Oviedo, I knew I wanted another workbench, but because we’re in a rental, and will most likely move again someday, I didn’t want anything permanent. And because my days of standing on my workbench for no particular reason are behind me, I decided I didn’t need something massive and sturdy. I remembered an old New Yankee Workshop episode where Norm Abram had built a work table completely out of plywood. He even made it so it could be rolled around, and then the wheels lifted out of place. I found the episode on YouTube and watched it several times for inspiration. After turning my plans over and over in my brain for a while, I finally settled on a design. But unlike my other workbenches, I actually sketched this one out. It had been a point of pride that I had designed my past workbenches and tables in my head, and didn’t make a single sketch. But this time, I needed some actual plans so I didn’t waste any wood or make expensive mistakes. For one thing, I was going to use all plywood, at $48 per sheet, and I didn’t want to buy too much, or have a lot of waste. So I sketched out the bench and created a cutting diagram. I even looked at it several times, so there may be something to this whole “plan it out in advance” technique everyone keeps talking about. I won’t go through all the construction details, except to say God bless the inventor of the square head screw. I’m a firm believer in this over the Philips-head screw. Also, the flathead screw was created by the devil himself. My son Ben helped me out quite a bit on this project. My son Ben helped me out a lot on this project too. I would explain the steps to him so he could see how things went together, how tools worked, and to get him interested in woodworking. (He has said he’d like to be a luthier, a maker of guitars, so I figured I might as well give him a taste of the woodworking life). I tried to get my daughters involved too, but they weren’t as interested. In the end, it took about three weeks to build the project, because I could only work on it on weekends, grabbing a few hours here and there. 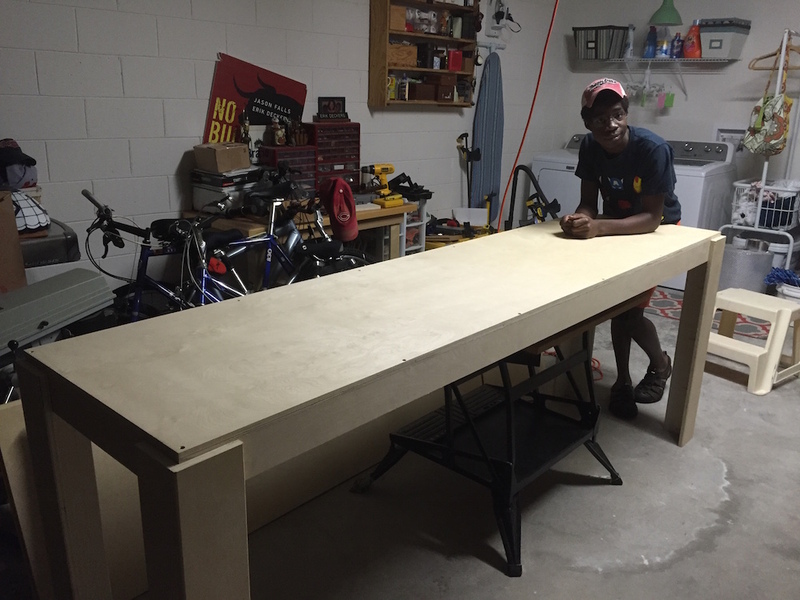 My neighbor, Mike, would stop by to check on my progress, and when I was done, I showed it off to him, complete with 4′ x 8′ peg board, and the triple-coated polyurethane top. Now, if we ever move again, I don’t have to leave anything behind. I can unscrew the peg board and shelves from the wall, and just cart everything onto the truck, where it can be reinstalled in my new garage. The completed bench and peg board. See how shiny the top is?! And there’s the shelf again, upper right. I built that about 17 years ago. 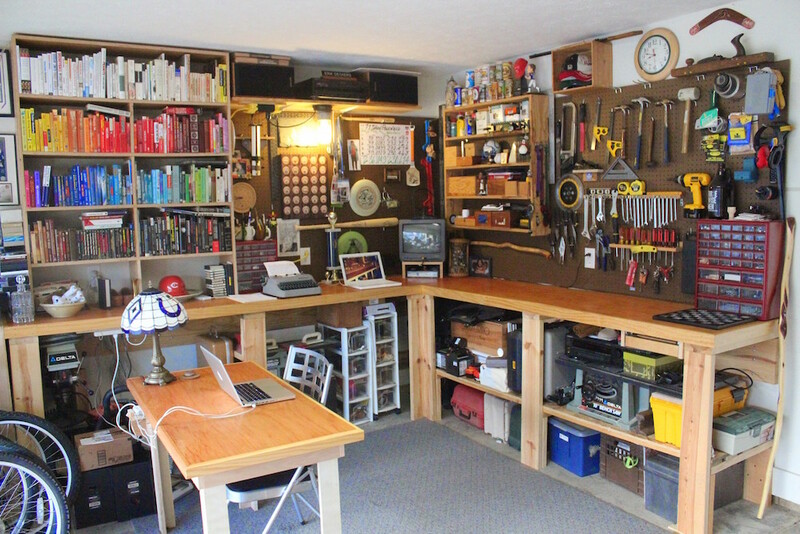 And I’m already thinking of new ideas for my next workbench. But I probably won’t be building one of my own. So if anyone wants some helping building a new workbench for their garage, let me know. I’ll be happy to help.